To prepare your garden bed, build a depth of at least 12 inches of SCM 50/50 Planter Mix (depths of more than 12 inches is acceptable). 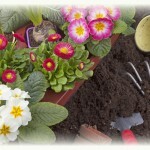 If your bed is less than 12 inches deep, loosen the soil underneath, then mix with SCM 50/50 or SCM Soil Conditioner. Add more 50/50 on top to achieve recommended depth. Since our climate is hot and dry, cover the garden with a wow mulch, such as SCM Garden Topper. This will not only keep the soil cool and moist, but the fir fines and nutrition in it will be beneficial to your garden. You can also simply use SCM Vegie Blend for your garden area, and that is all you need.